We are rapidly moving towards the Centenary of the cessation of hostilities in Africa at the end of WW1. Like VJ day was by Victory in Europe this is likely to be side-lined by the Armistice. We have a duty therefore to ensure that the actions of the KAR and its sister regiments operating in East Africa are recognised along with von Lettow Vorbeck’s schutztruppen and askari. The ‘closest crocodile to the canoe’ is: On the 26 August 1916 the 2nd Rhodesia Regiment and two companies of the 130th Baluchi Regiment captured the town of Morogoro in Central German East Africa. The capital had been moved here from Dar es Salaam in December 2014 as part of Colonel Paul von Lettow Vorbeck’s strategy to move the German centre of gravity away from the coast where the Royal Navy was active. Unfortunately he did not fight to the finish as many commentators expected him to but he withdrew leaving the civilians behind to the mercy of the Allies. 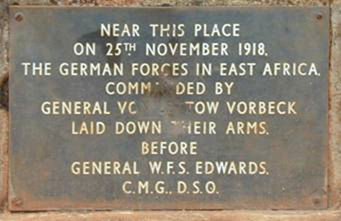 Fortunately the German civilians and natives of Morogoro were treated well by the Rhodesians and Baluchis and the community remained intact up until November 1918 when von Lettow Vorbeck’s surrendered force moved back down the line to Morogoro and were greeted in the traditional German homecoming of kaffee und kuchen (Jeffery 2015)! Harry Fecitt has promised his archive material to cover this period but if you have more we will edit and include it on the site or you could write an article for Rhino Link. We are also looking at how best to commemorate the German surrender on 25 November 1918 at Abercorn in Northern Rhodesia (now Mbala in Zambia). A ceremony at the KAR Memorial in the National Memorial Arboretum is a ‘no brainer’ but we, members of the Association, should make the effort to go to the place where von Lettow Vorbeck gave in to the Allies which included battalions of the KAR. Some courses of action will be presented to the Committee in November and a proposal will be presented to you following the meeting on the 9 November 2016. In the meantime, any ideas from Association members and readers of this web site will be gratefully received. Just use the ‘CONTACT’ tab and leave a message. We will respond to all of your suggestions and feed back to you our plan that will be agreed by the Committee. Jeffery K (2015), Chapter 8 The War in Africa in ‘1916 A global history’. Bloomsbury, London.